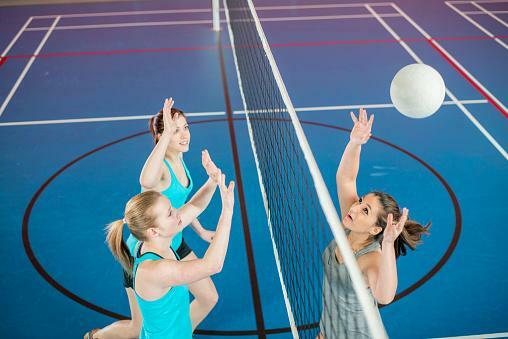 Gym class is a time to exercise and have fun playing sports or other games. 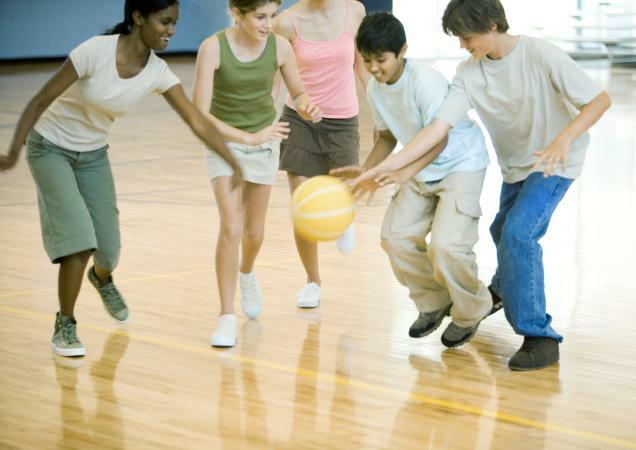 Help teens have a great, active time in gym class when you play a variety of games including old favorites, new discoveries, and original games they create with you. Over time as physical education programs grew and developed, a few standout games were introduced and became classics because of their wide appeal. 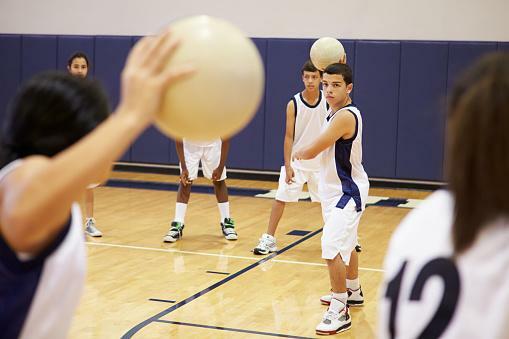 Gym class dodgeball is highly competitive, requires little equipment, and involves the whole class at once. The point of the game is to eliminate all the players on the other team by hitting them with a ball or catching a ball they throw. There are two teams with any number of players and only a few balls in play to make the game challenging. What's fun about dodgeball is you get to hit your friends, or enemies, with a flying object with the permission of a teacher. If you have a teacher who likes to play, it's also fun when the class teams up to get him out. A relay race is a small team activity with endless possibilities. Essentially you need at least two teams, each with at least two people. The more teams and players, the more fun and competitive the game. One player at a time completes their designated leg of the race then tags the next teammate to complete their leg and so on until the entire team finishes. Relay races can feature straight running or include a variety of activities like crawling, skipping, and walking backward. Fun Attic offers more than 10 ideas for funny and entertaining relay races like ones using tricycles, balloons and bananas. To play handball you need a large gymnasium with lots of open wall space and some handballs. Handball skills and games can be played on an individual basis or in groups. Teens use only their hands to hit the ball toward the wall then keep hitting it back as it bounces off the wall. This coordination game is fun because it involves an individual challenge and the repetition can be addicting. This game is exactly as it sounds, made up of four squares. All you need to make a court is some tape and space where you can tape down a grid featuring four equal, intersecting squares. The goal is for an individual player to get others out and advance to the fourth square, which is the highest level. There is one game ball that you try to bounce inside another square without the person in that square hitting to another square. Any number of kids can play Four Square because it is high-paced and features a line for waiting players who enter the game when someone gets out. This game is super simple to play, but it is highly addictive which makes it fun. This version of kickball is a team game that accounts for individual skills and preferences. Instead of standard bases, Matball uses large gym mats as bases because multiple players can be on a base at one time. There are two teams, one starts as the kicking team and the other in the outfield. Each kicking player advances to the first mat then decides on each teammate's turn whether they think they can make it to the next base without getting out. The team with the most runs at the end of the game wins. Teens have the most fun when they work as a team and run the bases in a large group or create distractions to get the fastest players home. If you want an individual activity, obstacle courses are a great way to encourage each student's skill set. Basically, you want to create a course with various obstacles and time each person as they attempt to complete the course. Classic obstacles include crawling through tunnels, funny walks like the crab walk, and zig-zagging through a line of cones. While this might not sound like much fun for teens, it can be when you get creative with obstacles. Capture the flag has many versions, but the basic indoor game is like a team game of tag. Each team tries to steal the flag(s) of the other team before theirs gets stolen. To make the game more exciting start with at least four teams instead of the traditional two. Give each team more than one flag and rule that only one flag can be taken at a time or include bonus point items. Basketball - Learn the basic rules of this two-team game from Basketball Breakthrough. Volleyball - The Art of Coaching Volleyball offers standard gameplay and set up, along with relevant terminology. Ping Pong - Find information on rules, setup, and table dimensions from Kids Sports Activities. Baseball - Dummies.com gives you the simplest breakdown of the complicated rules in this outdoor game. Soccer - Learn the history, rules and team strategies of gym class soccer with this study guide. Football - Standard football rules are often modified in gym class with no tackling, like in Flag Football. Swimming - Groups with access to a swimming pool teach everything from basic strokes to pool exercises to group water games. Lacrosse - When played in P.E. classes, the game uses modified equipment and rules. By the time kids reach high school they've had a chance to experience several sports either as players or spectators. Teens who are die-hard athletes or passionate about a specific sport find these traditional games fun and exciting. However, teens who aren't as active may struggle to enjoy a curriculum loaded with competitive sports. In recent years, physical education class standards across the country have seen major changes. The new focus is on promoting health for all kids, not just the ones who excel at or love sports. In addition, a report by Scholastic points out the recent changes seek to engage kids in physical activities and recreational games they are likely to continue participating in through adulthood. Teachers now look for ways to encourage individual participation in activities selected by each student or group games with less competition. With gameplay similar to football, basketball, and soccer, Ultimate Frisbee is a non-contact team sport using a frisbee in place of a ball. To play you'll need a large, open area like a football field. The best aspect of this game is that anyone can play and teamwork is essential. In order to score, teams need to utilize all of their players because once you have the frisbee you can only pivot, not run. The lack of contact also prevents injuries and levels the playing field for kids who aren't as athletic. This slow-paced game is played just as it sounds. Like golf, there are designated "holes," a target of some kind like a safety cone or a tree, you try to hit with a frisbee in the least number of throws possible. Frisbee golf works best in a large outdoor area but can be played inside a large gymnasium. Those will limited resources can designate found objects like trees and fences as holes outside or tape spots on the wall around the gym indoors. This is an individual game with an element of competition when teens play against each other for the lowest score. A combination of tennis and ping pong, this active game features simple rules and a slower pace great for people of all ages and skill levels. To play you need a court similar to a tennis court with a net, pickleball paddles, and the ball which resembles a whiffle ball. Play a singles game or play with a small team. Teens will feel like their in a giant-sized ping pong game. When capture the flag mixes with a snowball fight, you get Yuki Ball. Based on a Japanese game, teams hide behind barriers and launch small softballs in an effort to protect their flag and steal the other team's flag. To play you need to buy a Yuki Ball kit for around $800 that includes balls, barriers, pinnies and buckets. Two teams of up to seven people on each can play at one time, but you can have more than one game going at a time in a gymnasium. If you have a small budget, make your own set with cardboard box barriers and wool dryer balls or the fake snowballs you find around winter in stores. Tie in pop culture with your curriculum when you include this fun game inspired by The Hunger Games novels and movies. The main goal is to be the last person standing in the game. To do this, you'll need to avoid getting hit by "weapons" like dodgeballs and pool noodles wielded by other players. The Hunger Games Competition can be played in a gym, in several rooms or outdoors. To start, all the "weapons" are placed in the center of the room and the players are placed in a circle at equal distances from the center. Teens can try to get a "weapon" or choose to run away. Each person hangs a bandana or flag from their waist that, when pulled off, eliminates them from the game. If a person gets hit with a weapon, they aren't out of the game, but they do lose the use of whatever body part got hit for the rest of the game. This high-paced game gets the whole class moving at once, requires cooperative teamwork, and incorporates other areas of learning. In Hoop Scrabble, you form small teams and give each a hula hoop to place on the ground in their designated area around the perimeter of the gym. Dump a ton of small balls, like tennis or ping pong balls, in the center of the room. Teams then have to collect balls and spell a word inside their team's hoop before any other team does or before anyone steals their balls. What's great about this creative game is teens don't need to be athletic to have fun playing. Once all the balls have been collected, teams start stealing from each other which makes the game more fun. Sometimes the best gym games are the ones you and the teens create. Take inspiration from traditional or classic games then make them unique using special equipment or rules. Think of this as an advanced form of follow the leader. You don't need any equipment, just an open space, and some creative, willing kids. Divide the group into teams of at least five people on each team and set each team in a line, one person behind the next. Teams will jog together staying in a line. The teacher will call out "Shape Shift" at various points and teams must react appropriately at that time. To start, the first person in each line forms a shape or pose with his arms and everyone in line holds the same position as they start to jog. When you call out "Shape Shift" the second person in each line forms a new arm pose and all other team members copy it. To do this, the first person in line will need to turn around and will be jogging backward for the rest of the game. Repeat these actions until the entire team is turned backward. This is a fun, non-competitive game. Flag team is an individualized version of capture the flag. Give each student a designated spot in the gym with a hula hoop on the floor and a flag in the middle of the hoop. The goal is for each person to protect their flag but also steal at least one other flag. If your flag is stolen, you choose another person who still has their flag to join. You cannot steal any more flags once you are out, but you can help the other person defend theirs. The rules are simple in terms of offense and defense. You cannot stand inside your hoop nor anyone else's. To stop someone from stealing your flag you must tag them on the back only. If you get tagged on the back by any player at any point in the game, you are out. Everyone has a different definition of fun. Create a physical education class inclusive of every kid when you choose a wide variety of games. The only true way to know if teens will like a game is to try it out. So, introduce some new games and see which ones become favorites with your group.